Home Articles Is Paul Lambert’s Five-Man Defence Aston Villa’s Main Problem? Is Paul Lambert’s Five-Man Defence Aston Villa’s Main Problem? 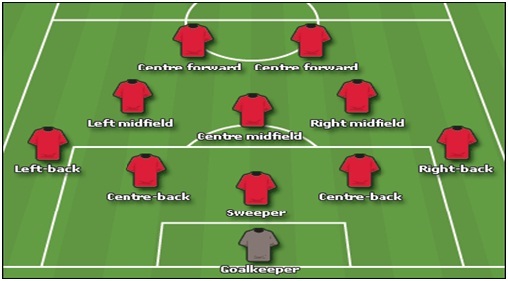 Those who play Football Manager will know how frustrating it can be getting your formation right. Some coaches choose to chop and change depending on factors such as opposition, players available and whether or not their team are at home or away. Some coaches already know what formation they want to play, and fit the players around that. For Paul Lambert, he’s certainly adapting to the players he has available as well as the new trend of five at the back, adopted by the likes of Wigan, Liverpool and Manchester City at times this season. Whether this has proved successful for those clubs mentioned this year, is a matter of opinion, I would say it hasn’t been, with Wigan flirting with the relegation places and the two bigger clubs “under performing” whilst playing that way. However, at Anfield on 15th December this year, 5-3-2 worked a treat for Paul Lambert and Aston Villa. For the majority of the game against Liverpool, the home side completely dominated. 61% possession as well as 17 out of 26 shots on target suggest they should have taken something from the game, but Villa’s resistance with the help of Brad Guzan helped us keep out Suarez and co. under the cosh, allowing us to use the weapon that is Christian Benteke on the break. It was far and away one of the stand out performances by any Premier League club this year, but the scoreline covered up the fact that Villa did ride their luck at times, and Liverpool’s finishing wasn’t perhaps up to scratch. Chelsea’s finishing however, was up to scratch. As soon as Villa conceded against a bigger club, the heads of the youngsters went down and they didn’t know how to come back. They crumbled, and it was a very worrying sign. Some people called it an anomaly, a one-off, one to forget. Lambert had put his five brave defenders who came out battered and bruised from Anfield, and threw them to the lions again. 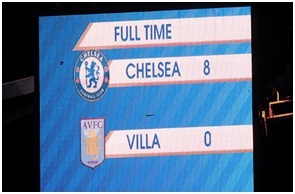 This time they couldn’t keep the opposition out, and Villa offered absolutely nothing going forward. Benteke was constantly offside and appeared unwilling and incapable of working hard to hold the ball up for the home side, as opposed to the master class attacking performance he offered up on the break against Liverpool. The formation failed against Chelsea. At home it is harder to soak up pressure and play on the break. Fans get restless and there needs to be some sort of intention to attack. Lambert had some thinking to do. The Villa Park match ball is now on the top of Gareth Bale’s Christmas tree. Onto Tottenham at home and once again the manager set up with five at the back. He probably thought that after conceding eight, Villa needed to tighten up, but bar a few changes in personnel the setup was the same. For 45 minutes we took a complete battering, enduring 15 corners (one less than the most a single team had won over 90 minutes this season before then) and endless pressure. Then came the decision at half time, do we continue as we were and hope we win the lottery with a clean sheet? Or do we change the shape and try and open the game up? Lambert was brave, bringing on Ireland instead of Lichaj for Baker and then Albrighton for Westwood, who had looked nervous and shaky again. We came out of the blocks flying second half and could have scored a couple if we had taken our chances. In the end, Lowton switched off to let Defoe through for the first, and Benteke’s poor decision-making at the other end allowed Spurs to hit us on the break for the second. It seemed little was learned, when the home game against Wigan seemed to replicate the Chelsea and Spurs games. The score could have been worse than 3-0 too…and lets not forget, Wigan were in the bottom three before kick-off, yet managed to boss Villa all game. So what conclusions can Lambert draw from his defensive formation’s 15-0 Christmas nightmare? 1. Playing five at the back can be effective, particularly away from home. But defenders are under pressure constantly and an early goal knocks our young side’s confidence. 2. At home, five at the back is negative, and a real worry if a team like Spurs play two up top. Every time Bale got round the full back, the three central defenders were dragged into areas they didn’t want to be. 3. Four at the back opens up the game, but it creates chances which gives Benteke more opportunities. It may be a bit riskier but providing we have three midfielders prepared to do the work backwards as well as forwards, it can still be solid. 4. Benteke has perhaps believed his own hype after the Liverpool game and became complacent. The sheer amount of times he was offside in the Chelsea/Spurs games was staggering and his hold up play was poor at a time when we needed him most. 5. With Nathan Baker hobbling off against Spurs we now only have four fit defenders excluding Chris Herd, who has been covering at centre half. With Lichaj coming in and Lowton moving into one of the central three berths again Wigan, it’s certainly stretching the quality of the first 11. I’d personally like to see my Villa team find a balance and have a go like we did for 15 minutes against Spurs, rather than this soaking up pressure nonsense which has worked for us a couple of times, but has also failed rather drastically. Playing 5 at the back means you have to have quality full backs who can work the full length of the flanks. It also requires 3 quality centre mids who can keep hold of the ball, win the ball, and get tight when they need to. We have neither of those things – central midfield is sorely lacking any bite and determination, full backs are inexperienced and low on confidence.